I created separate email accounts to receive email from each of the 25 presidential candidates (and donated money to all them). This allows me to track their behavior -- or misbehavior. Rick Perry exited the race 50 days ago. Today, I got two emails to my special Perry address. 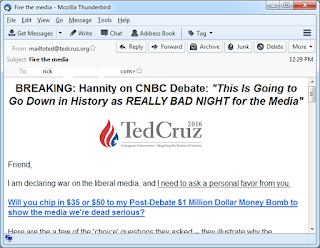 One email was from Ted Cruz, another presidential candidate. 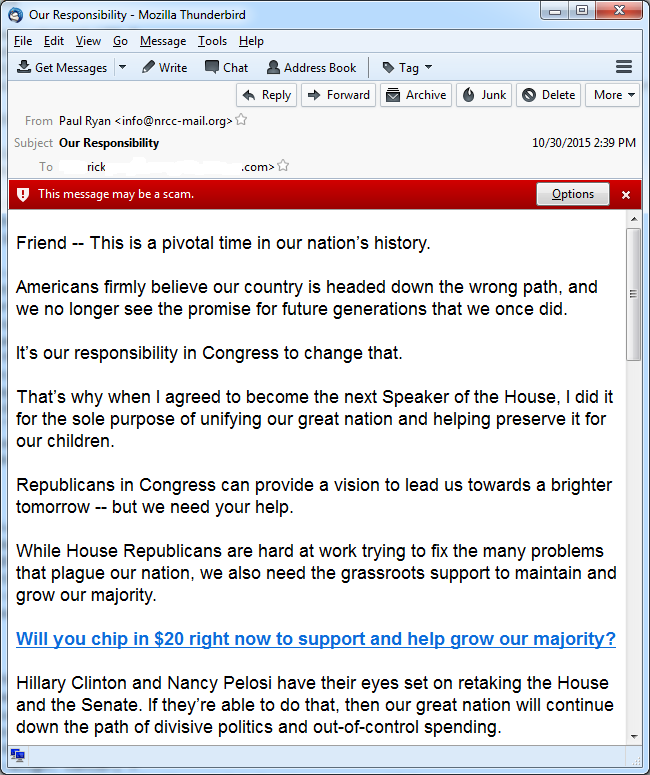 The other was from Paul Ryan, the new Speaker of the House. Here's Ted Cruz's email, sent to my Perry account. It's actually identical to one I received on my Cruz account. (I've hidden the To: address, except for the 'rick' part). 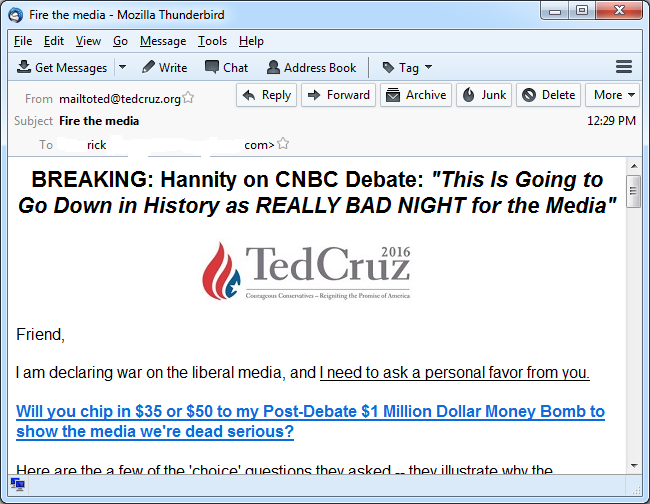 Rick Perry uses the company "TargetedVictory" for his mass emailings, where Ted Cruz uses another company. This shows that Perry didn't give his address list to Cruz, but instead let Cruz use the address list. 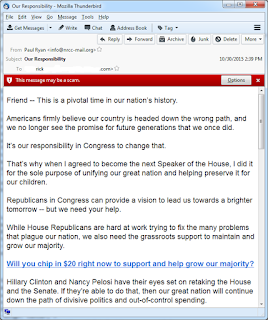 The other email was from Paul Ryan asking for donations to the NRCC. Apparently, the reason Paul Ryan took the job of Speaker was solely for the children. What is the NRCC? I had to look it upon Wikipedia. It's a SuperPAC setup in 1866 to support House Republicans. They get a couple hundred million dollars in donations every year. There's a similar DCCC for the Democrats. As a side note: Thunderbird claims this might be a "scam". I love the irony. So why these emails from Perry? One answer could be money, that they paid him to use his mailing list. Another could be politics, that in exchange for pimping his donors, he could receive political consideration for other things, like being named ambassador or something. Thirdly, he could just be a nice guy who wants to see Republicans and his fellow Texan win. My bet is this, that we'll see Perry officially endorse Ted Cruz in the next couple weeks, announced at some major event, timed to give Cruz a boost in the polls. If that's the case, then this would be an interesting lesson in how projects like this can scoop what's going on inside the campaigns. "My bet is this, that we'll see Perry officially endorse Ted Cruz in the next couple weeks, announced at some major event, timed to give Cruz a boost in the poles." Ah, yes, the coveted Polish demographic. Yes, we have the Polish, and also something talking from inside "the police". "nothing in the police says he won't use my private information in this manner." Homophones aside (I wonder if the author used speech-to-text software? ), this email setup is an interesting idea. NRCC and DCCC aren't SuperPACs, they play by an entirely different set of rules - they have to disclose their donors and they have maximum donation limits, for instance.